« TWWPCaSG raises awareness of prostate cancer at Sainsbury’s Store, Lampeter, 14 June 2014. 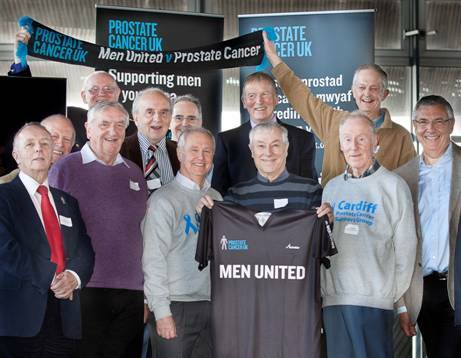 On 11 February 2014 Prostate Cancer UK arranged a lunchtime reception at the Senedd; an opportunity for men with prostate cancer to meet both Assembly Members and the new Cardiff Prostate Cancer UK team. On the back row left and right, holding the banner can be seen Ron Davies and Ken Jones with Phil Burr back row second from right, all TWWPCaSG Trustees.